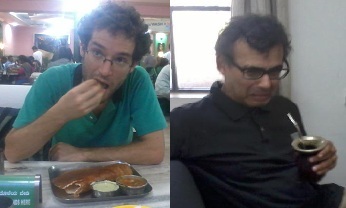 Miguel Campiglia, a postdoc at the Raman Research Institute (RRI), enjoying a traditional south Indian dish: masala dosa. Madhavan Varadarajan (professor at RRI) not enjoying traditional South American drink: mate. asymptotic conditions be suitably incorporated in quantum theory? Our work analyses this issue in the broad context of the Loop Quantum Gravity (LQG) approach. At first it may seem this cannot be possible: The fundamental excitations in LQG are distributional geometries supported on 1-d graphs (so-called spin-networks), very far removed from the smooth flat space we want to asymptote to. This is not an unfamiliar issue. It is understood that LQG describes a highly quantum phase of gravity, and that flat space would arise out of infinite linear combinations of highly dense spin-network states. A possible effective description of such a situation for compact spatial topologies was suggested by Koslowski and Sahlman (KS). Their proposal can be described as a new representation of LQG in which one allows for smooth 3 dimensional excitations of spatial geometry in addition to the usual 1-d ‘spin network’ excitations of LQG. Remarkably, one can construct this representation without spoiling the main driving principle in LQG, namely diffeomorphism invariance. In our work  we generalise the KS representation to the noncompact spatial topologies appropriate to asymptotic flatness and incorporate, at the quantum level, the so called classical ‘parity’ conditions , suitably generalised from the ADM variables to the triad-connection ones which serve as the classical underpinning of the LQG approach. We proceed as follows. The KS states which correspond to asymptotically flat spatial geometries are those for which spin network excitations are confined to the interior of the spatial slice and for which the smooth 3-d excitations of the triad field satisfy classical asymptotic fall offs at infinity. The quantum analog of the asymptotic conditions on the connection arise in a less direct manner. KS states can be realised as wave functions on a space of distributional ‘quantum’ connections with connection dependent operators, obtained by integrating connections against suitable ‘probe’ functions, acting by multiplication. As is standard in field theory, the properties of the quantum connections are then dictated by properties of the ‘probe’ functions. In order to define the action of connection dependent operators in such a way that they are consistent with the quantum asymptotics of the triad, it turns out that these probes have to satisfy precise asymptotic conditions and it is these conditions which ensure that the quantum connections satisfy an appropriate generalization of the asymptotic conditions obeyed by the classical connections. It then turns out that the space of these ‘asymptotically flat’ KS states supports the unitary action of spatial diffeomorphisms which are gauge transformations as well as spatial diffeomorphisms corresponding to asymptotic translations and rotations. This fact depends delicately and crucially on our incorporation of the parity conditions in quantum theory. This unitary action facilitates the imposition of the quantum diffeomorphism constraints on a suitable space of states and ensures a unitary representation of the asymptotic Euclidean group on this space. In addition, the unitary action of asymptotic rotations allows a precise implementation of the ‘half-integer spin from gravity’ idea of Friedman and Sorkin . A technical point to be noted is that the gauge diffeomorphisms include ‘odd supertranslations’ which do not die down at infinity and that the incorporation of these additional gauge diffeomorphisms does not affect the result predicted by Friedman and Sorkin. Another important technicality is our adaptation of the parity conditions to the semianalytic category in which LQG is formulated (this category strikes a good balance between the overly restrictive analytic case, and the wild realm of smooth fields). To our knowledge, the present work represents the first rigorous construction of an asymptotically flat kinematics for gravity. Further scrutiny will be required to decide whether the framework is physically viable, the crucial open problem being the construction of the quantum dynamics and the fate of energy positivity in quantum theory. T. Regge and C. Teitelboim, “Role of Surface Integrals in the Hamiltonian Formulation of General Relativity,” Annals Phys. 88, 286 (1974). “Spin 1/2 From Gravity,” J. L. Friedman and R. D. Sorkin, Phys. Rev. Lett. 44, 1100 (1980). This entry was posted in Author Insights, IOPselect and tagged quantum gravity by Claire Fullarton. Bookmark the permalink.